En juin 2016, le Duo Gindrat-Lefebvre (violon-violoncelle) nait. Un an et demi plus tard, il s'apprête à enregistrer son 1er CD et à lancer un nouveau projet: les concerts à la carte! After one and a half year of playing together and getting to know our repertoire better, we want to give new orientations to our duo. The idea is to come to you, in your living rooms and to share a moment of emotions in a small setting. We are interested in your wishes and your opinions! We would love to propose a system of «MENU CONCERTS» where you can choose what you’d like to listen to! To do it, we will create a series of videos, where we will present you our repertoire. To launch this project, we planned a recording session in February 2018. and a collaboration with a professional designer and a professional photographer. Be a part of our adventure! Let’s begin this DIALOGUE together right away! The program is based on the theme of the DIALOGUE between our two instruments. The chosen pieces reflect the evolution of the counterpoint, from two to four voices. Marie-Ophélie Gindrat and Gaëlle Lefebvre met for the first time in the Haute Ecole de Musique of Neuchâtel. A rich musical collaboration followed, to discover a rich repertoire thought numerous public performances. With the public, they shared their passion and love for chamber music, delicate mixed of fusion and individuality. That’s how the Duo Gindrat-Lefebvre was born in June 2016, wanting to make their instruments’ voices heard in smaller settings and offering a huge range of colours and possibilities in the best of their abilities. These two musicians are full of energy for this new musical adventure, ready to present this unknown repertoire to the public with its numerous treasures. This project ended successfully on 18/1/2018 12:00! You want to know which music inspire us? We will send you a playlist with our favourite music full of different styles. Recevez chez vous un exemplaire de notre CD dédicacé par nos soins. Would you like to listen to the CD and enjoy the treats? We will send you a dedicated CD with a homemade pot of cookies in a beautiful glass jar. You desire to get to know us better? Discover our origins though delicious meals from the Pays Basque and Switzerland. Do you want to get to know our instruments better? Get a private violin or cello lesson, for beginners or experimented, with a dedicated CD. Do you like to exchange and share around a drink? We bring you an aperitif accompanied by our gourmet basket and two CDs (Basel, Neuchâtel, Fribourg, Biel, Bern) to share a moment of dialogue with you! Vous avez une chanson préférée? Vous souhaitez en avoir une version personnalisée? Nous l'arrangeons, l'enregistrons et vous l'envoyons accompagné d'un CD dédicacé par nos soins. You want to hear the Duo live? We will be glad to offer a private concert in the place you will be choosing. 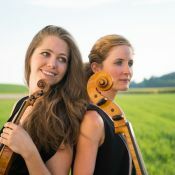 Le Duo Gindrat-Lefebvre est composé de la violoniste Marie-Ophélie Gindrat et de la violoncelliste Gaëlle Lefebvre. Toutes deux diplômées des plus grandes écoles internationales, elles sont passionnées par la musique de chambre. Leurs instruments se complètent magnifiquement et elles ont à cœur de partager des moments forts de qualité avec leur public grandissant!